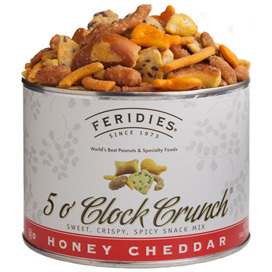 A favorite among our staff and customers, 5 O'clock Crunch® quickly disappears every time it is served. 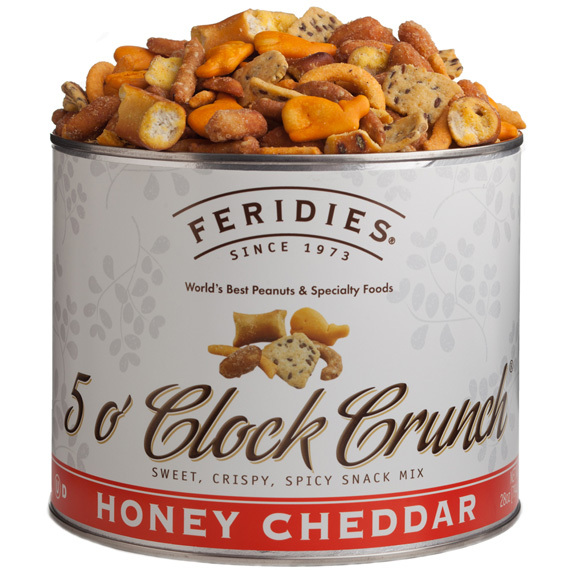 This popular mix includes honey roasted peanuts, cheddar cheese crackers, chili-lemon corn sticks, honey roasted sesame sticks, honey mustard pretzel sticks and salted corn chips with flax seed. The dimension of each 28 oz. can is approximately 6" x 5". Shelf life is approximately 1 year. OU Dairy Kosher Certified. Save over 8% with the 4 Pack versus single can purchases. This mix is my absolute favorite. I eat it all the time and love it!! We discovered this last winter and oh my!!! Nothing is finer with a glass of white wine, Cosmo, or Maker's Mark. I have given this to several friends as a gift and now they are ordering directly. Divine!!! 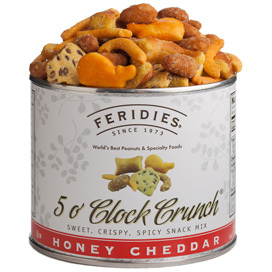 Received the '5 oClock Crunch' for Xmas - best snack I have ever had - amazingly delicious. Will purchase many as gifts in 2019!